Transcription factor 3 (E2A immunoglobulin enhancer-binding factors E12/E47), also known as TCF3, is a protein that in humans is encoded by the TCF3 gene. TCF3 has been shown to directly enhance Hes1 (a well-known target of Notch signaling) expression. This gene encodes a member of the E protein (class I) family of helix-loop-helix transcription factors. 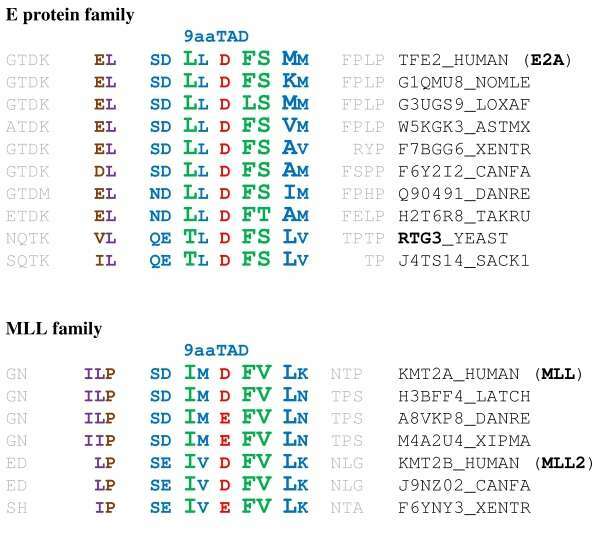 The 9aaTAD transactivation domains of E proteins and MLL are very similar and both bind to the KIX domain of general transcriptional mediator CBP. E proteins activate transcription by binding to regulatory E-box sequences on target genes as heterodimers or homodimers, and are inhibited by heterodimerization with inhibitor of DNA-binding (class IV) helix-loop-helix proteins. E proteins play a critical role in lymphopoiesis, and the encoded protein is required for B and T lymphocyte development. This gene regulates many developmental patterning processes such as lymphocyte and central nervous system (CNS) development. E proteins are involved in the development of lymphocytes. They initiate transcription by binding to regulatory E-box sequences on target genes. Additionally, development of the neocortex of the brain is controlled in part by a Wnt signaling pathway. This pathway is essential for proper neuronal differentiation and proliferation of neural precursor cells. However, Wnt must be suppressed until it is the appropriate time in development to initiate neuronal differentiation and proliferation of neural precursor cells. The TCF3 gene has been shown to play a role in suppressing Wnt for this purpose. Furthermore, TCF3 has been shown to represses β-catenin in this pathway as well. Undifferentiated neural precursor cells contain high expression of TCF3, but as those cells become more differentiated, the expression of TCF3 decreases. Therefore, lack of TCF3 increases neural precursor cell reprogramming and greater expression of TCF3 suppresses reprogramming of neural precursor cells. In a TCF3 knock out model in mice, the mesoderm forms, but the structures of the mesoderm, specifically structures of the CNS, are duplicated. Therefore, repressive functions of TCF3 are necessary for proper anterior-posterior axis development. Deletion of this gene or diminished activity of the encoded protein may play a role in lymphoid malignancies. This gene is also involved in several chromosomal translocations that are associated with lymphoid malignancies including pre-B-cell acute lymphoblastic leukemia (t(1;19), with PBX1 and t(17;19), with HLF), childhood leukemia (t(19;19), with TFPT) and acute leukemia (t(12;19), with ZNF384). ↑ "Diseases that are genetically associated with TCF3 view/edit references on wikidata". 1 2 3 "Entrez Gene: TCF3". ↑ Henthorn P, McCarrick-Walmsley R, Kadesch T (Feb 1990). "Sequence of the cDNA encoding ITF-1, a positive-acting transcription factor". Nucleic Acids Research. 18 (3): 677. doi:10.1093/nar/18.3.677. PMC 333499 . PMID 2308859. ↑ Kamps MP, Murre C, Sun XH, Baltimore D (Feb 1990). "A new homeobox gene contributes the DNA binding domain of the t(1;19) translocation protein in pre-B ALL". Cell. 60 (4): 547–55. doi:10.1016/0092-8674(90)90658-2. PMID 1967983. ↑ Piskacek, S (2007). "Nine-amino-acid transactivation domain: Establishment and prediction utilities". Genomics. 89: 756–768. doi:10.1016/j.ygeno.2007.02.003. ↑ Piskacek, Martin; Vasku, A; Hajek, R; Knight, A (2015). "Shared structural features of the 9aaTAD family in complex with CBP.". Mol Biosyst. 11: 844–851. doi:10.1039/c4mb00672k. ↑ Quong MW, Romanow WJ, Murre C (2002). "E protein function in lymphocyte development". Annual Review of Immunology. 20: 301–22. doi:10.1146/annurev.immunol.20.092501.162048. PMID 11861605. ↑ Kuwahara A, Sakai H, Xu Y, Itoh Y, Hirabayashi Y, Gotoh Y (2014). "Tcf3 represses Wnt-β-catenin signaling and maintains neural stem cell population during neocortical development". PLOS ONE. 9 (5): e94408. doi:10.1371/journal.pone.0094408. PMC 4022625 . PMID 24832538. 1 2 Lluis F, Ombrato L, Pedone E, Pepe S, Merrill BJ, Cosma MP (Jul 2011). "T-cell factor 3 (Tcf3) deletion increases somatic cell reprogramming by inducing epigenome modifications". Proceedings of the National Academy of Sciences of the United States of America. 108 (29): 11912–7. doi:10.1073/pnas.1017402108. PMID 21730189. ↑ Merrill BJ, Pasolli HA, Polak L, Rendl M, García-García MJ, Anderson KV, Fuchs E (Jan 2004). "Tcf3: a transcriptional regulator of axis induction in the early embryo". Development. 131 (2): 263–74. doi:10.1242/dev.00935. PMID 14668413. ↑ Herblot, Sabine; Aplan, Peter D.; Hoang, Trang (2002-02-01). "Gradient of E2A Activity in B-Cell Development". Molecular and Cellular Biology. 22 (3): 886–900. doi:10.1128/MCB.22.3.886-900.2002. ISSN 0270-7306. PMC 133542 . PMID 11784864. 1 2 3 Goardon N, Lambert JA, Rodriguez P, Nissaire P, Herblot S, Thibault P, Dumenil D, Strouboulis J, Romeo PH, Hoang T (Jan 2006). "ETO2 coordinates cellular proliferation and differentiation during erythropoiesis". The EMBO Journal. 25 (2): 357–66. doi:10.1038/sj.emboj.7600934. PMC 1383517 . PMID 16407974. 1 2 3 Bradney C, Hjelmeland M, Komatsu Y, Yoshida M, Yao TP, Zhuang Y (Jan 2003). "Regulation of E2A activities by histone acetyltransferases in B lymphocyte development". The Journal of Biological Chemistry. 278 (4): 2370–6. doi:10.1074/jbc.M211464200. PMID 12435739. ↑ Maira SM, Wurtz JM, Wasylyk B (Nov 1996). "Net (ERP/SAP2) one of the Ras-inducible TCFs, has a novel inhibitory domain with resemblance to the helix-loop-helix motif". The EMBO Journal. 15 (21): 5849–65. PMC 452333 . PMID 8918463. ↑ Deed RW, Jasiok M, Norton JD (Apr 1998). "Lymphoid-specific expression of the Id3 gene in hematopoietic cells. Selective antagonism of E2A basic helix-loop-helix protein associated with Id3-induced differentiation of erythroleukemia cells". The Journal of Biological Chemistry. 273 (14): 8278–86. doi:10.1074/jbc.273.14.8278. PMID 9525934. 1 2 3 Langlands K, Yin X, Anand G, Prochownik EV (Aug 1997). "Differential interactions of Id proteins with basic-helix-loop-helix transcription factors". The Journal of Biological Chemistry. 272 (32): 19785–93. doi:10.1074/jbc.272.32.19785. PMID 9242638. ↑ Johnson JD, Zhang W, Rudnick A, Rutter WJ, German MS (Jul 1997). "Transcriptional synergy between LIM-homeodomain proteins and basic helix-loop-helix proteins: the LIM2 domain determines specificity". Molecular and Cellular Biology. 17 (7): 3488–96. doi:10.1128/mcb.17.7.3488. PMC 232202 . PMID 9199284. ↑ Miyamoto A, Cui X, Naumovski L, Cleary ML (May 1996). "Helix-loop-helix proteins LYL1 and E2a form heterodimeric complexes with distinctive DNA-binding properties in hematolymphoid cells". Molecular and Cellular Biology. 16 (5): 2394–401. doi:10.1128/mcb.16.5.2394. PMC 231228 . PMID 8628307. ↑ Neufeld B, Grosse-Wilde A, Hoffmeyer A, Jordan BW, Chen P, Dinev D, Ludwig S, Rapp UR (Jul 2000). "Serine/Threonine kinases 3pK and MAPK-activated protein kinase 2 interact with the basic helix-loop-helix transcription factor E47 and repress its transcriptional activity". The Journal of Biological Chemistry. 275 (27): 20239–42. doi:10.1074/jbc.C901040199. PMID 10781029. ↑ Maleki SJ, Royer CA, Hurlburt BK (Jun 1997). "MyoD-E12 heterodimers and MyoD-MyoD homodimers are equally stable". Biochemistry. 36 (22): 6762–7. doi:10.1021/bi970262m. PMID 9184158. ↑ Chakraborty T, Martin JF, Olson EN (Sep 1992). "Analysis of the oligomerization of myogenin and E2A products in vivo using a two-hybrid assay system". The Journal of Biological Chemistry. 267 (25): 17498–501. PMID 1325437. ↑ Hsu HL, Wadman I, Baer R (Apr 1994). "Formation of in vivo complexes between the TAL1 and E2A polypeptides of leukemic T cells". Proceedings of the National Academy of Sciences of the United States of America. 91 (8): 3181–5. doi:10.1073/pnas.91.8.3181. PMC 43539 . PMID 8159721. ↑ El Ghouzzi V, Legeai-Mallet L, Aresta S, Benoist C, Munnich A, de Gunzburg J, Bonaventure J (Mar 2000). "Saethre-Chotzen mutations cause TWIST protein degradation or impaired nuclear location". Human Molecular Genetics. 9 (5): 813–9. doi:10.1093/hmg/9.5.813. PMID 10749989. ↑ Huggins GS, Chin MT, Sibinga NE, Lee SL, Haber E, Lee ME (Oct 1999). "Characterization of the mUBC9-binding sites required for E2A protein degradation". The Journal of Biological Chemistry. 274 (40): 28690–6. doi:10.1074/jbc.274.40.28690. PMID 10497239. LeBrun DP (May 2003). 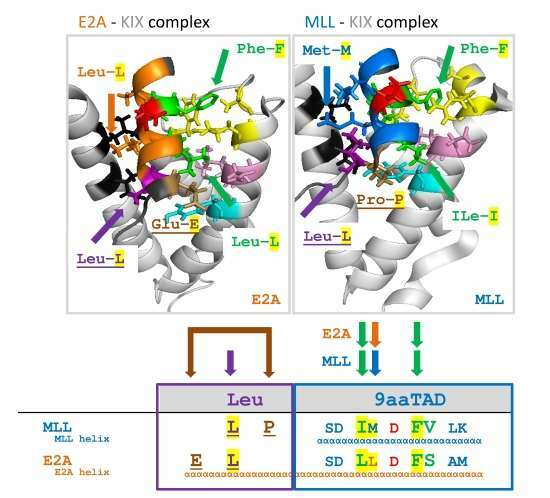 "E2A basic helix-loop-helix transcription factors in human leukemia". Frontiers in Bioscience. 8 (1-3): s206–22. doi:10.2741/1030. PMID 12700034.